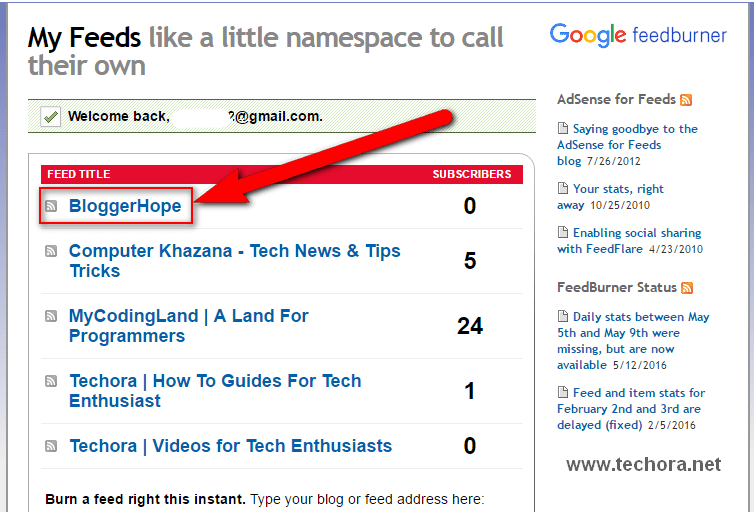 Now in this article, you can learn how to add Feedburner recent posts widget into your blogger blogs or any other blog. Feedburner is a Google RSS service which provide you the most recent posts directly to your visitors. You can add a email subscription box using FeedBurner into your blogger blogs. It is a very simple and unique service, which provide you to show you the most recent posts published on your blog to your readers. I previous published a post with title “How To Add Add Recent Comment Widget into Your Blogger Blog” . Feedburner subscription box also very useful and almost 80% bloggers use this service to collect their reader emails and provide their fresh contents directly into their email accounts. Now here, we’ll discuss of how to add feedburner recent posts widget into your blogs. Feedburner can catch your daily RSS Feeds and show in a way of list to your readers. This widget is very useful and many blogger also use it. If you like it then share with your friends . This widget is very cutomizable and you can make it more customized according to your needs. Here are something important which you can easily customize using their interface. So these are some kinds of things which you can easily customized using Feedburner infertface. Now below is the complete guide of how to adding this feedburner widget into your blogger blogs. Step 1 – First of all go to the Feedburner Official Website, and sign in to your account . Here all your blogs RSS feeds available, now select your desired blog where you want to add this widget. Note – Sign in Using any Gmail ID. Step 2 – Now after selecting your blog, simply click on “Publicize” button from the main navigation bar. Step 3 – After that, click on the “BuzzBoost” button from the left sidebar. Step 4 – Now here you can made some changes according to your needs. Like total number of posts displayed in the widget, links open in same window or new window, Display the Feed Title etc. After customizing your widget simply click on “Activate” button . Step 5 – Now here is the code / script which you can use for your widget into your blog. Step 6 – Now simply go to the Blogger.com . Step 7 – Select your blog and go to their “Layout” , and click on “Add a Gadget” link. Step 9 – Here copy above Code / Scripts and paste it into the box and save your widget. Step 10 – Save Arrangements and see your blog live. Now you’re done it. It will help your readers to see out the most recent posts of your blog or any other blog directly via this widget. If any problem take place while adding this feedburner gadget into your blog, then simply comment below . I’ll reply you as soon as possible.